The Bureau of Labor Statistics is just out with its figures on union membership in 2014. Overall membership, aka density, fell to 11.1% of the workforce, from 11.3% in 2013. The decline was more than entirely the result of slippage in the private sector, down from 6.7% to 6.6%. Public sector density, perhaps surprisingly, rose, from 35.3% to 35.7%. Since private sector employment is more than five times that of the public sector, the private sector decline dominated the public sector’s rise, producing the overall drop. 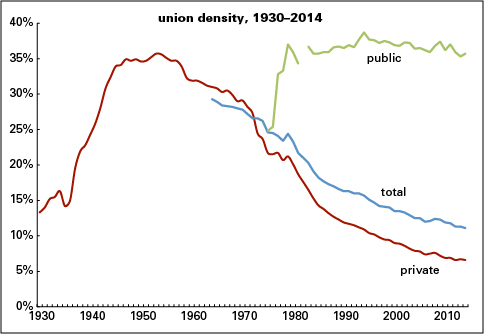 Here’s a graph of union density over time. Current private sector density is half what it was in 1930, just before the great surge in membership during the Depression. Its rate of decline has slowed over the last decade, but there’s no sign of a turnaround. And despite the uptick in public sector density last year, the line has been essentially flat for 30 years. By age group, union membership rose only among the youngest (16-24) and oldest (65+) cohorts. The decline was sharper for adult men (-0.3 point) than women (-0.1). By race/ethnicity, density declined among whites (-0.2), blacks (-0.4), and Hispanics (-0.2), but rose a full percentage point for Asians. Density declined for most occupational and industry groups, with some interesting exceptions. By occupation, management, law, healthcare practitioners, and sales all bucked the downward trend; by industry, broadcasting/telecommunications; arts, entertainment, and recreation; accommodations; and bars and restaurants all rose (though the last just barely). The lists of gainers are at odds with the traditional image of unions. Efforts to organize retail showed little payoff, as density fell 0.2 point. Within the public sector, union membership rose at the federal and local levels, and declined at the state level—it looks like that’s where the effort to destroy public sector unionism is having its effect. Union status matters for wages: overall, unionized workers earned 27% more than nonunion (measured by median weekly earnings for full-time workers). The effect was especially pronounced for weaker, more discriminated-against demographic groups. The youngest group, aged 16–24, enjoyed a 28% union premium; the advantage declined with each successive cohort, down to 12% for the 65+ set. Women aged 25 and older enjoyed a 27% premium, compared to 15% for men. White men (16 and over) had a 20% union advantage, compared with 32% for white women; for black men, the premium was 29%, compared to 34% for black women; and for Hispanics, it was 44% for men and 46% for women. Asian men were a notable exception, with the unionized earning 5% less than the non-unionized—but Asian women showed a 14% union premium. It’s no wonder employers hate unions so much. As profoundly flawed as American unions are, they can vastly improve the wages and working conditions of their members. Reblogged this on Dr. Todd A. Comer. Is it possible that the rise in union membership among 16-24 workers is due to people in that age group leaving the labour force (which they would presumably be less likely to do if they have a union job) rather than an actual increase in union participation? Actually employment rose about 2% in the 16-24 group and union membership by 8%. But few members of this age group belong to unions – density went from 4.2% to 4.5%.